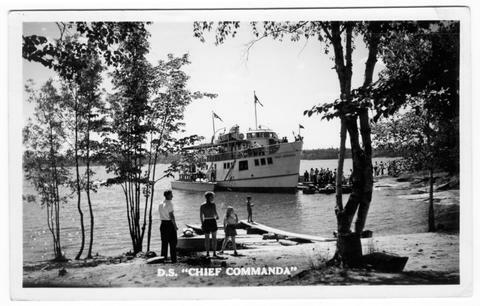 Item 024 - D. S. "Chief Commanda"
Postcard was cancelled at North Bay, Ontario, Canada, on 19 July 1952. Card is addressed to: Mrs. Bernie Engley. 143 Union Street. Autoboro. Mass. Message reads: Hi - Thanks for the nice long letter - we are enjoying it here and Marls is getting a good rest and lots of sun & good food. I have a fine crop of freckles wasnt the con?cution wonderful we listened to it all and heard the big news while driving up. ? love Mary.